What about WINESERVER,WINELOADER,WINEDLLPATH variables? I think these shoud be set to. export WINEVERPATH="path to wine-1.1.33 instalation"
Good tutorial! if you want something like cedega our crossover that alows yoto manage wine versions for diferent aplications you should realy try play on linux. PlayOnLinux does all this automagically, hidden beneath a GUI, including scripts for the required tweaking to make some specific programs work. Similar to the commercial apps like Crossover etc, but Free. But some of us like to do this by hand or for example to have custom patched versions of Wine on our system(s). instead of going to the trouble of opening a gksudo gedit -- instead you can alter this line to do the same thing. just change the names. (faq, what the cmd TEE does is just print the output of any command to a file.. very useful. can save entire directory lists, any command which has verbose output involved. I have written a script containing everything you described. It depends on Vim and I use Ubuntu. 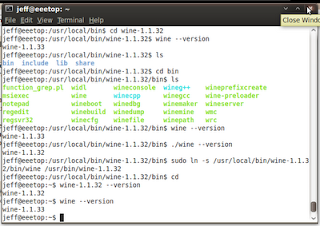 cd /usr/src/wine-1.5.10 && ./configure --prefix=/usr/local/bin/wine-1.5.10 && make depend && make && sudo make install && sudo ln -s /usr/local/bin/wine-1.5.10/bin/wine /usr/bin/wine-1.5.10 && sudo ln -s /usr/local/bin/wine-1.5.10/bin/wine /usr/local/bin/wine-1.5.10/bin/wine-1.5.10 && sudo vim +"normal i/usr/local/bin/wine-1.5.10/bin/winecfg" +"wq /usr/bin/winecfg-1.5.10" && sudo vim +"normal i/usr/local/bin/wine-1.5.10/bin/regedit" +"wq /usr/bin/regedit-1.5.10"